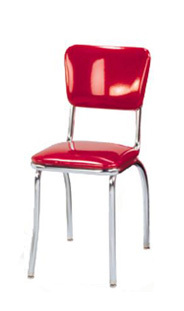 This Classic C1 Retro Diner Chair is one of our most popular selections. Proudly Made in the USA, and built to last! Our C1 Retro Diner Chair is available in your choice of vinyls, including the very cool zodiac, sparkle, and cracked ice. This model is one of our most popular diner chairs, reflecting the nostalgia of the Fabulous Fifties! You are looking at the BEST QUALITY diner chair (rated for up to 400 lbs, with a lifetime structural warranty) at absolutely the BEST PRICE on the web. Purchase only 1 or purchase 100; we can satisfy any residential or commercial customer!